Heat oven to 350°F. Spray 13x9-inch (3-quart) glass baking dish with cooking spray. In medium bowl, mix chicken, 1 1/2 cups of the cheese, the chiles and sour cream. Layer 3 tortillas in baking dish, overlapping as necessary and placing slightly up sides of dish (cut third tortilla in half). Spread about half of the beans over tortillas. Top with about half of the chicken mixture and half of the enchilada sauce. Layer with 3 more tortillas and remaining beans and chicken mixture. Place remaining 2 tortillas over chicken mixture, overlapping slightly (do not place up sides of dish). Pour remaining enchilada sauce over top. Sprinkle with remaining 1 1/2 cups cheese. Cover baking dish with foil. Bake 45 to 55 minutes or until bubbly and thoroughly heated. Let stand 5 to 10 minutes before cutting. 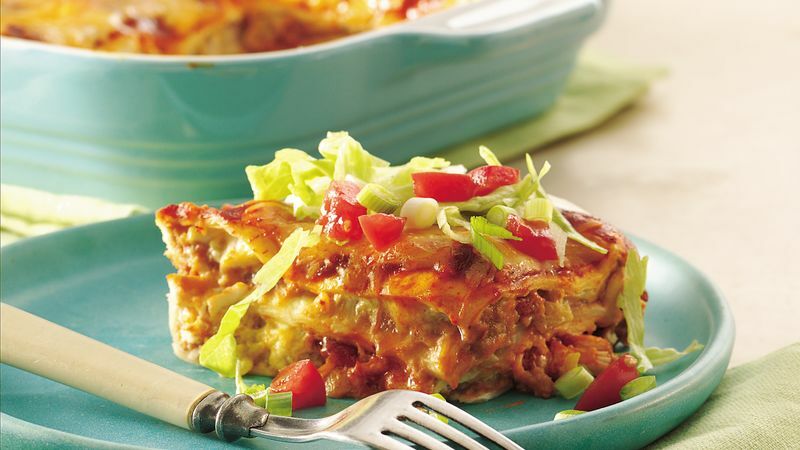 Garnish casserole or individual servings with onions, lettuce and tomato. Make this casserole up to 8 hours in advance, then cover and refrigerate until it's time to bake it.